Before You Expect a Dog to Stay on a Place, Teach Him to get on Willingly..
Place provides a strategy to keep the dog out of the way when needed. Teaching a dog to remain in one location is something most dog owners want. I frequently get asked "How do you teach the dog to stay?" 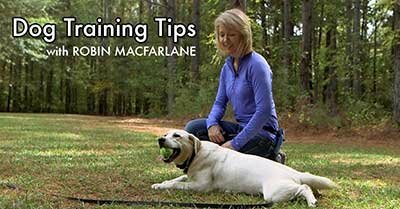 Rather than go right into teaching a Down/Stay or a Sit/Stay, which requires the dog to maintain that exact position, I encourage people to teach a Place command instead. Place teaches the dog to stay on, or within a certain boundary area. Typically the boundary is a raised cot, dog bed or small mat. It should be an item large enough to allow the dog to get comfortable and change position but small enough that it is relatively easy to move around or transport. Teaching this concept of Place is often enough for pet owners who just want the dog to remain somewhere for certain times during the day. For instance, when having dinner or when visitors arrive at the door. It is also easier and faster for most dogs to catch on to as opposed to the Down/Stay or Sit/Stay. The idea of a visible and easily defined area that the dog must remain on is clear to the dog and the human. But before we can teach our dogs to remain on their Place, we first have to teach them to get on the item without resistance. For some dogs that is not as easy as it may sound. Some are hesitant to step up or on a new object. And they are often hesitant if we use force on the leash and they feel they are being pulled. Most dogs that feel forceful leash tension resist by pulling in the opposite direction. My preference in teaching a dog to go on a place is to generalize the idea of "getting on to" something before I make them remain there. I have my dogs step onto cots, and raised platforms, boulders, tree stumps, picnic tables, etc. The key in getting them to go willingly is to lure, and guide rather than pull. If the object is large enough to accommodate me as well, I've found it really easy to encourage the dog to come up, if I go first. This idea also works well for those dogs that aren't good about jumping in a vehicle. 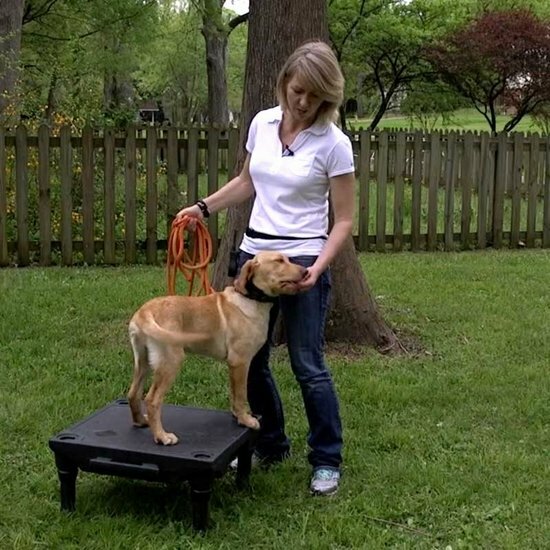 If you are constantly having to lift your dog, take a look at a few of these ideas and see if they work for you in getting your dog to go more willingly. Pull-Quote= Place provides a strategy to keep the dog out of the way when needed.